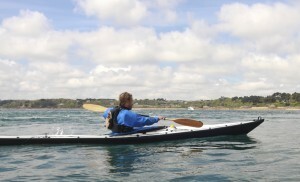 The Inuit-style Naraks folding kayaks have long slim hulls that are easy to paddle and look very elegant. Their lines are the result of many generations of incremental development, perfected over thousands of years. Most notably they sit lower in the water and have less internal volume than for example the Raid series, with their high bows and hard-chine hulls making them very seaworthy. (They’re not you’ll be pleased to hear, completely true to the originals: seals do not have to donate their skins, and whales do not have to donate their frames!) And of course being something that we sell, the Nautiraid Naraks also fold up, which makes them rather easier to transport and store in the modern world. 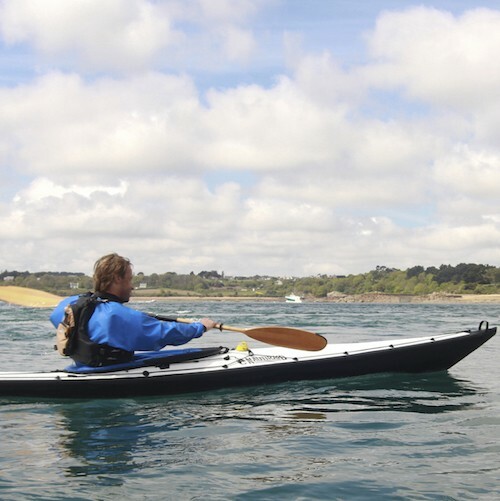 There are three sizes of single paddler Narak – the 405, 460 and 550 featured on this page – and also a very elegant double, the Grand Narak 550 here. 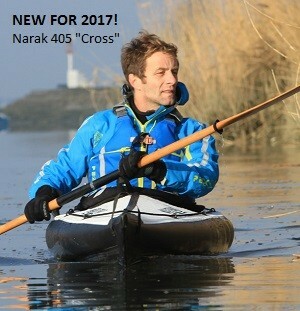 – NEW Narak 405 “Cross”. When we visit the factory this is unofficially referred to as the “Oru beater” (you can see Oru Kayaks elsewhere on this site); Nautiraid were not going to sit back and idly watch the “American upstarts” take their market! Indeed they have learnt from them and seen that whilst there is still a market for “connoisseur kayaks” (varnished wood frames, 80 year heritage etc) today there is clearly also a market for lower maintenance, faster assembly boats. So the new Narak 405 can be assembled in 10 minutes, weighs just 16kg, and has a light but stiff aluminium frame with a superb (engineers’ delight) wedge-tensioning system that’s very simple and effective to use. At 405cm (just over 13ft) long it’s a great all rounder, with plenty of stability, easy to manouevre and, with its Narak series hull, surprisingly fast to paddle. Early signs are that it will become a if not the best seller in the range. (“Cross” by the way is an abbreviation of “Crossover”, referring to its versatility, rather than anger directed at recent market entrants!) Standard Narak 405 is £1695, higher spec version – rudder ready and with a better cockpit surround – £1895. 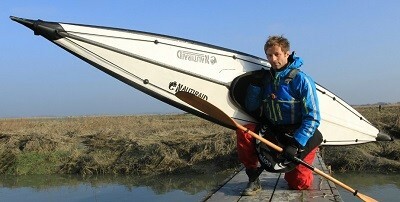 See further down page for a picture of the portability of the Nautiraid kayak range. 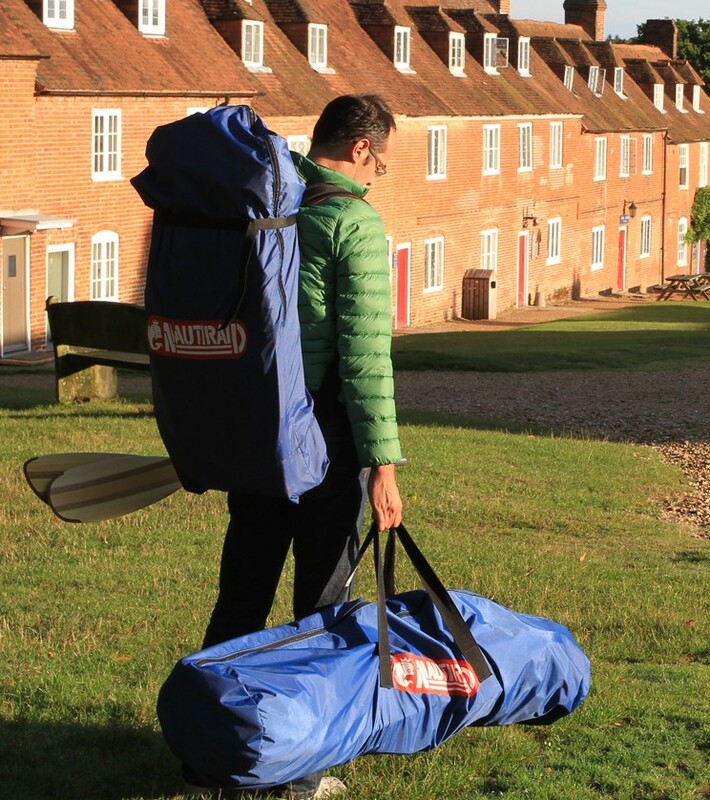 Kayaks in the Narak and Grand Narak range all fold down into two easy-to-carry bags. Nautiraid Canoes and Kayaks are available in four colours; grey, white, blue and red. Call us before ordering to discuss your requirements and colour preference. Depending on what we have in stock, we may need to have your boat built to order by the factory (“artesan workshop” may be a better description) in France. Narak kayaks pack down into two bags.